The Taste of Home in Packwood! Property 3: The Taste of Home in Packwood! Winter Ski/Summer Hiking Cabin and Vacation Getaway in the Mountains! 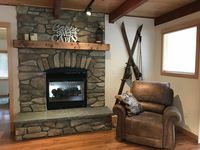 Property 6: Winter Ski/Summer Hiking Cabin and Vacation Getaway in the Mountains! Private 5 Acres in Packwood, close to Cowlitz River, Mt. Rainer & White Pass. Property 8: Private 5 Acres in Packwood, close to Cowlitz River, Mt. Rainer & White Pass. NEW!! Visit Mt. Rainier @ Historic Packwood Station- Hot Tub & Wifi! Pets OK! Property 17: NEW!! Visit Mt. Rainier @ Historic Packwood Station- Hot Tub & Wifi! Pets OK! Property 20: NEW! The Bunkhouse @ Historic Packwood Station- Wifi/Pets OK! Great for Groups! PACKWOOD SPECIAL! Price includes up to 10 people and no cleaning fee. 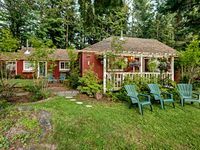 Property 24: PACKWOOD SPECIAL! Price includes up to 10 people and no cleaning fee. Property 29: Bears Den Mt Rainiers Family Destination. Loved the farmhouse&mdash;huge kitchen and everyone had their own bedroom (nephews were happy about that!). The hot tub was great for the skiers in the group. Spacious and Picturesque Cabin with All the Comforts of HOME and much MORE! My family and I just returned from our trip to High Valley Hideaway. We are all so impressed. First, the cleanliness of the cabin is impeccable, we truly felt pampered and at home. Second, the cabin is spacious and we didn't feel cramped. We were skiing and had all of our gear with us, the cabin has plenty of hooks and boot racks for ski gear, but it isn't in the main living room so we didn't have to stare at it all evening. Third, the cabin furniture and linens are quality. My husband liked the couches so much he tried to figure out the brand. Fourth, attention to detail, small things like lined trash bins in the bathrooms with small potpourri bags inside. Finally (although I could write a book about the cabin), it is so well stocked, and by well stocked I mean every room. Plenty of towels, extra bedding, kitchen items, and games. But the key is, the cabin is not cluttered, it has exactly what you need and no more. Our family will definitely be back. We have rented many cabins in the area and this is by far the best.